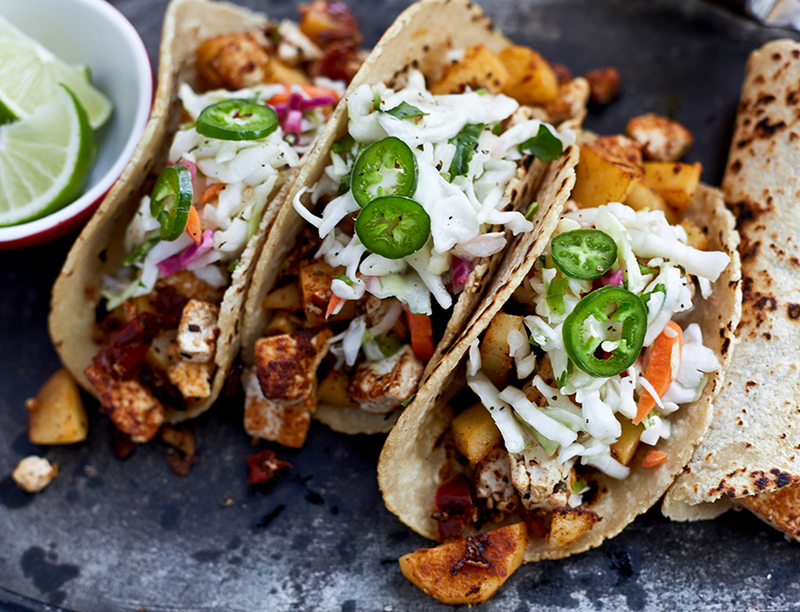 We teamed up with Mori-Nu Silken Tofu to bring you these super savory and delicious vegetarian tacos. Peel potatoes, dice into 1-inch chunks and transfer to a large saucepan. Cover with cold water, bring to a boil over high heat and simmer for 10 to 12 minutes until potatoes are tender but not mushy, then drain. While the potatoes cook, whisk together in a large mixing bowl the vegetable broth, chipotles in adobo, tomato paste, garlic, cumin, and oregano. Add cooked potato. Drain the tofu and dice into ½-inch cubes, transfer to the bowl and gently stir into the marinade. Cover and chill for 20 minutes. Meanwhile, prepare the slaw by tossing all of the ingredients together. Cover and chill until ready to serve. Preheat a large skillet over medium high heat and add 1 tablespoon of oil, tilting the pan to swirl over the bottom. Add half of the potato-tofu mixture and fry for 6 to 8 minutes, occasionally flipping the tofu and potatoes with a spatula. Fry until the potatoes are golden and tofu is hot. Transfer to a dish and repeat with remaining mixture and oil. Warm the tortillas by placing directly on a stovetop burner set on a medium flame, flipping with long handled metal tongs, about 15 seconds per side. For each taco, use two overlapping corn tortillas or one flour tortilla. Transfer a warm tortilla to a serving dish, top with a large mound of tofu and potatoes and top with cabbage slaw and garnishes. Pickled Red Onion: Place sliced red onion in a large jar and pour 1 cup of Marukan Seasoned Gourmet Rice Vinegar into the jar. Refrigerate for at least 1 hour. For maximum flavor, let onions sit longer in fridge or overnight. Pickled Red Onions can be stored up to 2-3 weeks. Pickled Jalapeños: Place thinly sliced Jalapeños in a large jar and pour 1 cup of Marukan Seasoned Gourmet Rice Vinegar into the jar. Refrigerate for at least 1 hour. For maximum flavor, let onions sit longer in fridge or overnight. Pickled Jalapeños can be stored up to 4 weeks.